Kathryn Boyle illustration: BIG heads! 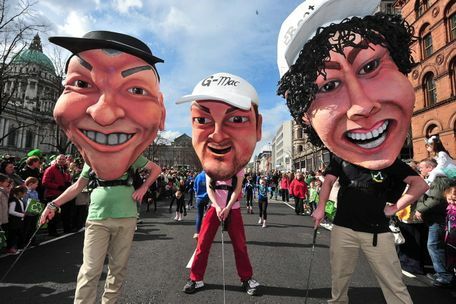 Three world famous Northern Irish golfers Darren Clarke, Graeme McDowell and Rory McIlroy warming up before St. Patrick's Day parade in Belfast, 2012. Rory and I hanging out before setting off for a walk through the city. Photographs taken by Christine Boyle. Photograph from Belfast Telegraph . Caricatures of the three world famous Northern Irish golfers Darren Clarke, Graeme McDowell and Rory McIlroy. These are a few images of the big heads made at the Beat Initiative! I made Rory McIlroy and my very talented friend Stephen Bamford made Darren Clarke and Graeme McDowell. The golfers made their debut at the St. Patrick's day parade in Belfast last year! I had great fun making Rory's head! At first it was quite daunting to try to make something from a block of polystyrene look like a well known figure! Getting the likeness was a challenge and it's easy to go too far however it was rewarding to hear people shout his name as they recognised him in the parade!! The Beat Initiative is a training, education and production company. It creates carnival parades and large-scale performances and brings music, dance, performance, colour and celebration! It does wonderful work with different groups in the community and brings people together through learning and creativity. The Beat has given me the opportunity to develop my skills, working with new materials and making things on a grand scale! Plus it's great craic (fun!) ! Labels: Beat Initiative, big heads, characters, sculpture.